Need a Wow Factor? 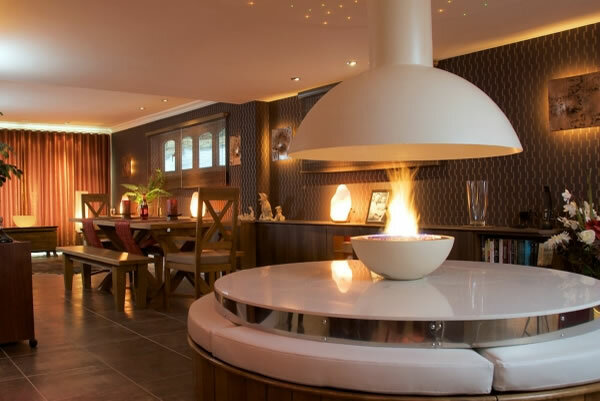 At CVO Fire we specialise in designing and manufacturing unique, desirable open central gas fireplaces for installation into both Domestic and Commercial Properties. Our Central Gas Fireplace designs have been installed in Wine Bars, Restaurants and Hotels around the World. With one of the largest collections of CE approved burner designs, canopies, materials and colour schemes to choose from – options are unlimited! We are able to supply a gas fireplace with a canopy fire design which will be beautiful, unique and will have customers returning time and time again. Our GAS FIRE TABLE AND CANOPY designs are shown in our GAS FIRE BOWL BROCHURE. 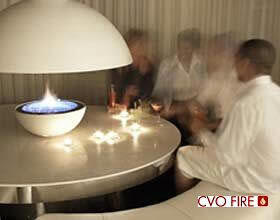 The CVO Central Fireplace or Fire Table Suite is an ideal focal point for any Commercial Property. Our round table gas fireplace design is suitable for Restaurants, Wine Bars, Hotels. 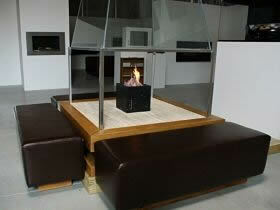 Install this gas fire in your commercial property and watch your customers come back time after time. This design adds a very special feature and the Mesmerising Flame from the CVO gas Fire bowl will have your customers talking, creating a special “Destination Location”. Installed in Commercial Properties around the UK and Worldwide. We can design a bespoke fire table design if required – Square, Rectangular and Circular Fire Tables have been supplied to customers with various canopy designs. All our contemporary gas fires are designed to operate on Natural Gas or LPG and carry full CE approval. Call 01325-301020 for help, advice and more information. This very special CVO design is made to a very high quality and can be seen in many wine bars and hotels around the World. 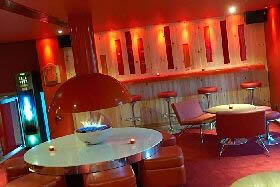 Supplied as a complete suite of table, dome canopy and circular gas fire bowl. There are unlimited options with this design and each is created to suit. Choose from many gas bowl options, canopy styles and table sizes. There are also many different finishes including hand polished bronze if required. Before considering this type of installation please call our trained sales consultants with your requirements. Shown left: Firevault Restaurant, London, UK. 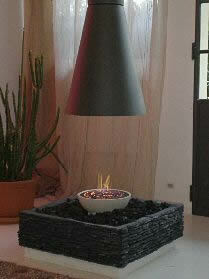 This open sided design includes a square fire table which can be supplied with various stone tops. It comprises a geometrix cube gas burner and 1.6m high glass canopy. This design is suitable for wine bars, hotels and restaurants. The high quality seats (x4) are available in a choice of leathers. This shows a typical installation however there are many design options via our bespoke design service. To complement the cherry red theme of this wine bar CVO designed a white stone fire table with a cherry red canopy and white circular gas fire bowl. This created a focal point within the bar which has customers returning week after week. There are multiple design options available to create a as fireplace like this. Speak to a Consultant on 01325-301020 to discuss your project. Shown left: Apres Bar, Birmingham, UK. Do you have a design idea? We have over 30 different gas burners and a wide range of bio-ethanol burners which we can incorporate into a bespoke fireplace design. Shown left as installed in Milan, Italy this unique design was created using a brick built fire pit with coals and a CVO circular gas fire bowl. A bespoke black cone canopy was also created to complement the design requirements. If you would like to discuss a design please call our sales team on 01325-301020 or e-mail your design idea and we will contact you by return. If you are considering installing an open table design in your property you are advised to call our experienced sales consultants who will be able to discuss your project in detail and advise the most suitable design available. Call 01325-301020 or Out of office hours please use our contact form. We are known in the industry for producing unique, open, central gas fireplaces. Our clients include major Hotel chains, Wine Bars, Restaurants, Architects and Interior Designers. Our Gas Fire Table Suites have been installed in properties all over the world including a property in the USA worth $15million owned by a famous film director. We have a wide range of standard Fireplace Canopies and Hoods to use with our Award Winning Burner Collection. The Dome – This is suitable for use with a Circular Gas Fire bowl and can be supplied in many finishes. The Cone – This is suitable for use with a wide range of gas burners and is available in many finishes. There are many design options, call us and we will create something special for you.